The public has been served admirably by our excellent NHS through difficult times. But now the NHS is hanging on by the finger tips of its truly heroic staff, frequently working extra shifts to cope with vacancies and often putting in hours of unpaid overtime. They cannot continue to do this and over the last 2-3 years, the NHS has entered a dangerous phase of decompensation. 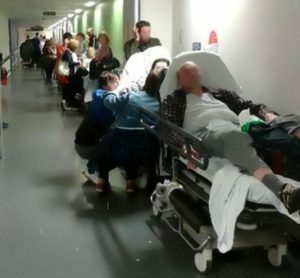 It is seriously struggling to cope and there are nearly 4 million on waiting lists – predicted to be 5 million by 2020/21; failures in cancer waiting times from referral to treatment threaten lives; and a failure to hit the 95% target for being treated within 4 hours in A&E for this whole past 12 months endangers patients and places intolerable pressure on staff! And all of this in the context of shocking reductions in social care budgets. The NHS has suffered its worst funding reduction ever, relative to actual need, under the eleven financial years 2010/11 to 2020/21 of first the Coalition Government (2010-2015) and then the Conservative Government (2015-2017 and 2017-current). 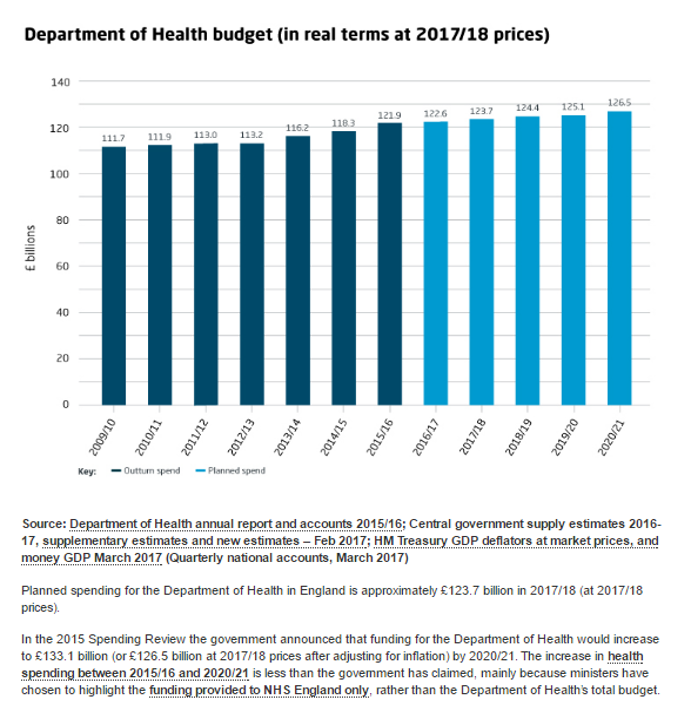 Under this regime, the necessary annual growth in NHS funding of 4% has been held back to an average of 1% – that is a 21%+ shortfall in funding over 7 years to 2016/17 – rising to 33%+ shortfall by the end of the four years to 2020/21. The Government knows this is crushing the NHS. The £20bn Nicholson Challenge of shortfall in NHS funding in the first five years has been followed by the £22bn underfunding spelled out in Simon Stevens’ Five Year Forward View – a plan motivated by the Treasury’s insistence on delivering this unprecedented underfunding of the NHS – rising to a £26bn shortfall at least by the end of the 6-year period to 2020/21. 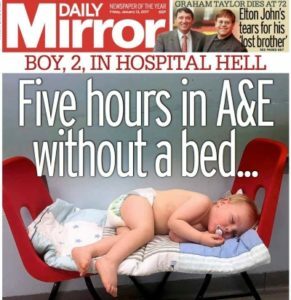 There is no doubt that this NHS austerity is (a) deliberate and (b) frankly dangerous. First, a wide range of politicians, think tanks and NHS employer organisations line up in condemnation of Jeremy Hunt, Secretary of State for Health since July 2012 and the Government of which he is part. See our post on this here. Since 2010, England has experienced relative constraints in public expenditure on healthcare (PEH) and social care (PES) … Spending constraints between 2010 and 2014 were associated with an estimated 45,368 … higher than expected number of deaths compared with pre-2010 trends [95% confidence interval (CI) 34 530 to 56 206] … Projections to 2020 based on 2009-2014 trend was cumulatively linked to an estimated 152,141 … additional deaths [95% CI 134,597 and 169,685] … Spending constraints, especially [in social care], are associated with a substantial mortality gap. Funding for the NHS is £123.8 billion in 2017/18 increasing to £126.5 billion by 2020/21. This amounts to an increase of only 0.7% per year in real terms – set against the accepted requirement of 4% the NHS received prior to 2010 in order to meet growing need and complexity. For the first time in decades, the Nuffield reports, next year’s increase of only 0.4% means that ‘per capita’ funding in England will fall from £2,226 per person 2017/18 to £2,220 2018/19. NHS Support Federation is working with the TUC (Trades Union Congress) to monitor the twin threats of advancing privatisation and the impact of cuts across the NHS. tion.We support the work of NHS Support Federation – have a look at the main site: nhscampaign.org here and, with the special focus on NHS funding cuts and STP plans, see its special site healthcheck.nhsfunding.info/fundournhs/ here. There you can put in your postcode and find out more about the funding cut and STP plans for your area.